Another item from my Asian Food Markets farewell-haul. (I miss them.) Last I heard, they were scouting new locations for a South Jersey store, but things have been pretty quiet. I hope for the best, but I fear that this might have been goodbye, for good. Contextually, this is easy to figure out. 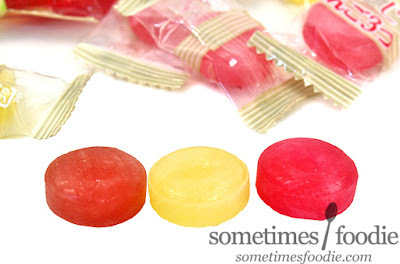 These are hard candies with different apple flavors, a pink, a red, and a gold. And since my hiatus, I still haven't learned to read Japanese, so we're going to be winging it a little in this one. I mean, I can tell it is three different varieties of apples, but I am not sure which ones and if these are region-specific. Thanks to the almighty-Google, I was able to find this, which looks almost exactly the same, but the golden apple in the center (on the right) is replaced with a green one. Pretty sneaky, sis. I guess apple variety packs are this brand's thing? Since the top and bottom apple image are the same as the one found online, I can assume they are Johnathan Gold and Fuji. The gold is still a mystery, but I am going into this with some healthy skepticism. Will these actually taste any different? We'll start with something I know, which is the Fuji apple. Fuji has been my go-to apple of choice since my college days working at Panera bread. In my experience they tend to be small, sweet, and juicy. A great snacking apple. 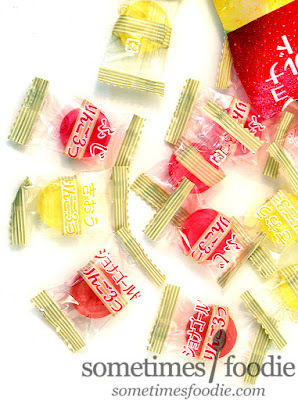 The color differences between the two "red"-flavors are rather subtle in real life, but thankfully each individual wrapper is marked with it's particular flavor. The darker Fuji candy is a transluscent, magenta-pink color and it smells like apple Gummisavers: sweet, bright, and concentrated. Does it taste like a Fuji apple? Kind of. It certainly tastes like apple. It's sweet, juicy, and slightly tangy with a crisper more authentic flavor than a green apple Skittle, but it's certainly not 100% realistic either. After a while I started to get some notes that remind me of apple skin, which made this seem a bit more real...but I have a hard time saying that this is distinctly Fuji apple. It's yummy, and tastes "red," not "green," but I want to say that this is a bit too bold to be a Fuji apple. I popped the candy into my mouth and I am very happy to report that it is significantly different from the Fuji. I'm impressed! 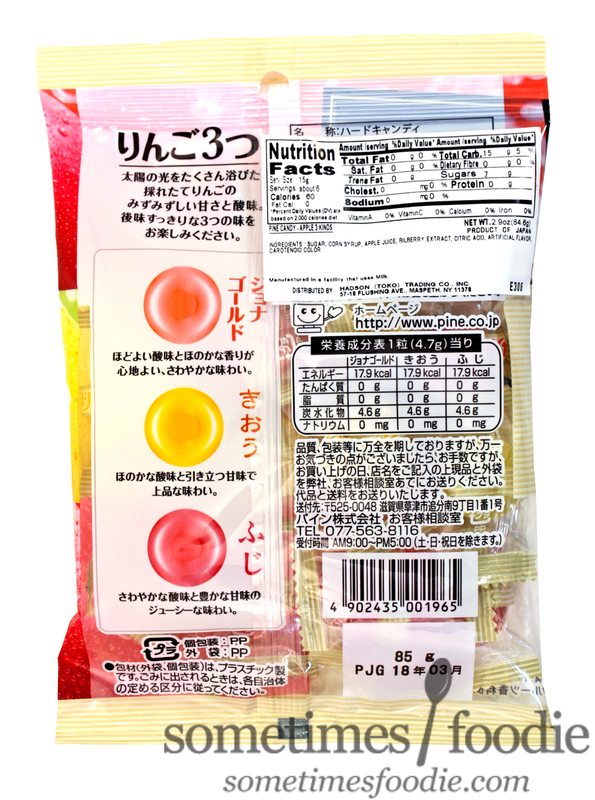 The yellow flavored apple is very light and refreshing, and bizarrely enough, it makes me think of golden pears as well as pineapple. It's a much lighter, subtle, and tangy apple flavoring that is really refreshing. 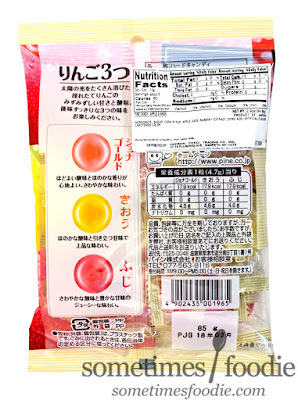 I'm not 100% sure what apple this is (if anyone can translate please let me know), so I can't speak to it's authenticity, but I will say it's even more authentically fruity than the last and it's actually my favorite of the three. Last up, Jonagold. This candy is a lighter, rosier, pink color and (again) it smells like nothing. I guess only the Fuji had a scent? So we have Snapple Apple, a refreshing pear-pineapple-apple pen, and a juicy "red" apple candy. Not a bad mix. It's a shame that I can't find more of these online, because with the Asian Food Market now closed, I am not sure I will see their like again. A must-try for apple lovers. 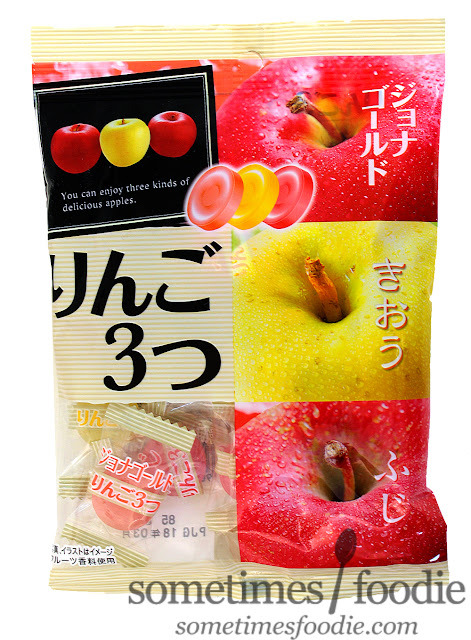 I don't know very much Japanese, but from what I can tell, the yellow apple in the bag you reviewed is a "Kiou" or "Yellow King" apple. And the green apple from the link you posted is an "Ourin" apple.